The Carriage and Western Art Museum in Santa Barbara was overflowing with guests supporting the “Cooking Up Dreams” chef competition in support of the Family Service Agency Santa Barbara, providing mental health and basic needs programs for underserved children, families, and seniors in Santa Barbara County. The competition for People's Choice and Judges' Choice awards inspired stiff competition at the 5th annual event. “This year we've assembled a great variety of culinary experts from Montecito to Buelton,” said Event Co-Chair, Marni Cooney. It was a fabulous selection of dishes, and judges Joey Buttitta, anchor for KEYT3; George Yatchisin, food and drink writer; Hilary Dole Klein, writer and editor and Geneva Ives. food and travel writer did a fine job. Joe Buttitta, KEYT3 anchor, said there were so many great dishes that it was very difficult to select the 2019 winner. Participating chefs included winners and favorites from last year as well as some first timers and they included Chef Chanel Ducharme of Bluewater Grill, Chef Ranferi Rios from Casa Blanca Restaurant, Chef Peter Cham from Finch & Fork, Chef Jeff Olsson of Industrial Eats in Buellton, Chef Weston Richards of Les Marchands Wine Bar & Merchant, Chef Michael Hutchings of Michael's Catering (2015 winner), Chef Damien Giliberti of Outpost at the Goodland (2018 Judges' Choice Winner), Chef Justin West of Soul Cal Smokehouse, Chef Taylor Melonuk of The Middle Child, Michael Amador of Uncorked Wine Tasting & Kitchen, and Chef Ron True of Desserts by Rincon Events. 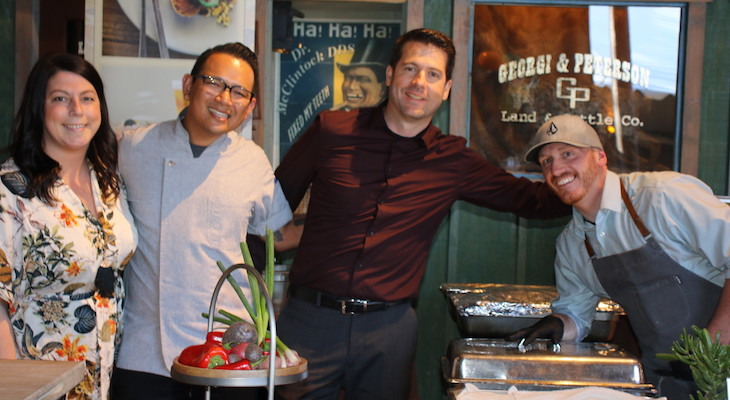 Chef Damien Giliberti of Outpost at the Goodland (2018 Judges Choice Winner), Chef Chanel Ducharme of Bluewater Grill, Michael Amador of Uncorked Wine Tasting & Santa Barbara FishHouse were top 2019 Peoples Choice. Renaud's Patisserie & Bistro was a new player this year and their braised beef bites were fantastic, and Michael's Catering (2015 winner) As usual, served some very fine tastes. Guests enjoyed complimentary wine from Babcock, Brander, Margerum, and Santa Barbara Winery, while music by DJ Scott Topper, a fabulous silent and live auction, and photo booth experiences by RUMOR kept guests entertained between sips and bites. Sponsors of the event included chef sponsors John and Tania Burke, and Les and Zora Charles; restaurant sponsors John and Jill Bishop, Michael and Marni Cooney, Tisha Ford, Robert and Susan Manning, Montecito Bank & Trust, Sandy and Dave Nordahl, Maryan Schall, and Union Bank. Maitre d' sponsors Bergquist Wang LLC, Tim and Ginny Bliss, Fred and Linda Gluck, Jim and Chana Jackson, Jim and Mary Morouse, Price, Postel & Parma LLP, SBCC Foundation, David Market at Coast Village Chevron. VIP sponsors Katya Armistead, Collete and Jeff Becker, Liz and Andrew Butchen, Rod Durham, Robert Janeway, Bruce and Cathy Milner, Kathy O'Leary, Gail Persoon, and Robert Reid. Family Service Agency (FSA) is a nonprofit social service organization that has served Santa Barbara County since 1899, continually improving the health and wellbeing of the community's most vulnerable children, families and seniors through teir transformative and essential programs: Big Brothers Big Sisters, Senior Services, Family Support Services, Youth & Family Behavioral Health and School Counseling Services. All services are provided free or on a sliding fee/donation scale and no one is denied assistance because of an inability to pay. Visit fsacares.org or call 805-965-1001 for more information. The Carriage Museum is a wonderful place for parties; lots of room and amazing "Old West" ambiance.